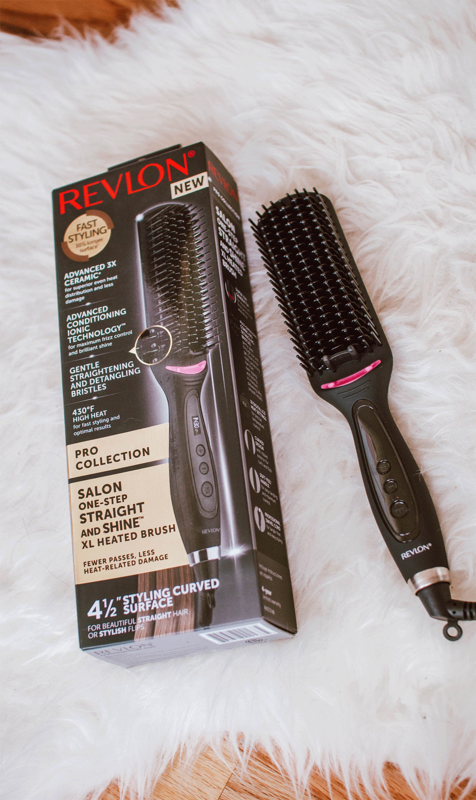 The Revlon Straightening Hair Brush is a heated brush that is supposed to straighten your hair as you brush it. Prior to my review video, I had not heard the best things about this, and read several less than stellar reviews. Curiosity got me, and I was so excited to try this! I have good news. You must read on! So to truly test this brush, I left my hair in a bun to make sure there were waves to straighten. I straightened one side on the lowest setting, and the other side on the highest setting to compare the results- the difference was huge! When I straighten my hair I use high heat because my hair is thick. I feel that I get the straightest and overall best results with max heat, so testing this brush out on the lowest setting was a true test for me. The lowest setting, 250°F, did actually straighten it as I ran the brush through, but it left my hair a bit frizzy and still with some waves. When I switched sides and used the brush on 430°F, and WOW what a difference. It made my hair shiny, and much straighter and smooth than the side with the lower temperature. This is HOT. Enough that I was worried about burning my face with it. 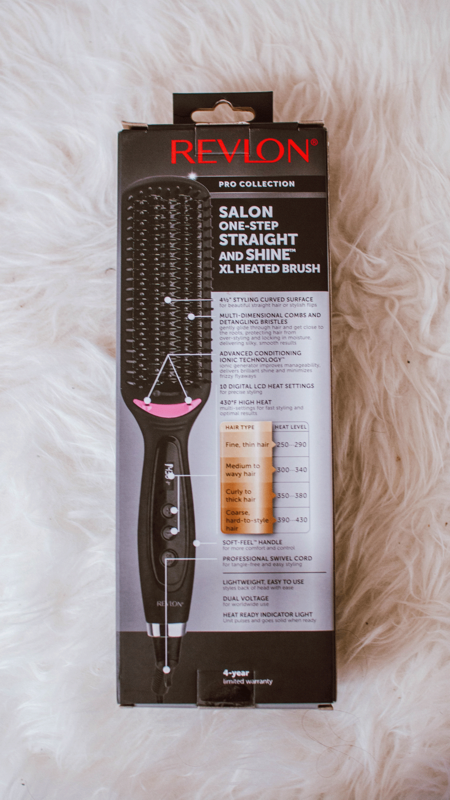 Revlon explains that the brush contains advanced three times ceramic technology for superior even heat distribution and less damage, advanced conditioning ionic technology for maximum frizz control and brilliant shine, and has gentle straightening and de-tangling bristles. It also states that it’s four and a half inch styling curved surface helps straighten or flip your hair. 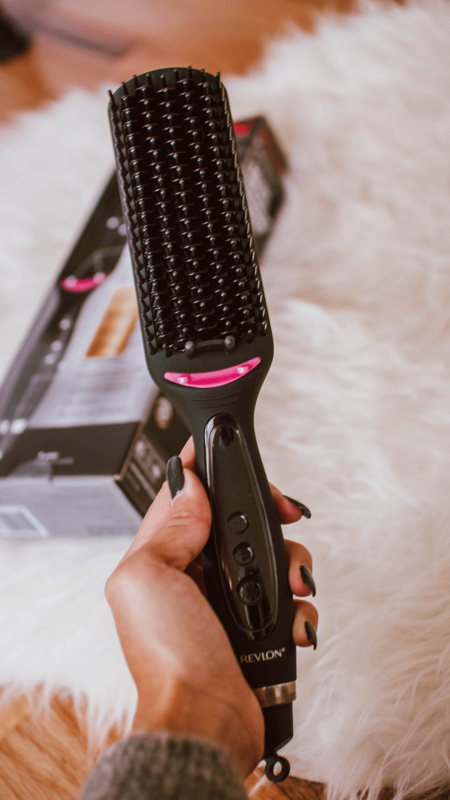 Using this straightening brush feels like you are just brushing your hair like normal. It is a big size, so it collects a lot of hair which I believe would be easier for those with long hair than a regular straightener. I haven’t figured out how to flip the hair out the right way, but I am excited to keep practicing and trying. Overall, I really like this brush. I am surprised that it worked as well as it did, especially after some of the reviews I read. For me, it’s a yes! Yay for new hair tools!